Check that your username and password are correct. If you forgot your password, you can recover it following this link. How I can access the advanced tools? First you have to sign up with MetricSpot filling out this register form. We have recently launched our website, so some options may not yet be functional. You will be able to access them over the coming weeks. Joining MetricSpot is totally free! Is there a limit of websites that I can analyze? You can generate all the website analysis reports you want. 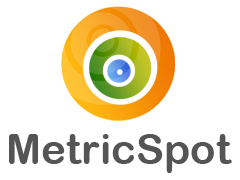 MetricSpot returns a percentage of the optimization grade of a given website. More than 80 metrics that affect the probability of generating a conversion are measured. In addition to the parameters that can be measured in MetricSpot, other variables such as the design of your website affect your chances of conversion. Take them into account! We measure more than 80 parameters that affect your website's SEO and usability. These parameters are grouped according to their type: SEO authority, Basic SEO, Content, Usability, Technical Aspects and Social Media. Not all parameters have the same influence when calculating the score, some are more important than others. Search engines such as Google, Yahoo and Bing do not follow website Standards. They don't need to optimize their websites for search engines because... they are the search engines! Their users enter the URL directly into the browser, they do not search for them online. And if they search for their name, they will always appear first because they are the most relevant result. I can't make my score go up! The distribution of the scores of all websites on the Internet is a bell curve, with the average score being approximately 50%. It should not be too difficult to get your site to have a score of 60% with a good On-Page optimization and content copywriting. Having a score above 75% is difficult because Off-Page parameters such as PageRank, traffic estimations and influence in Social Media are taken into account. You'll find few sites with a score higher than 85%, do not worry if it stays there! Try clicking the "refresh" button, just below your URL in the summary section. How often I can update the reports? You must wait at least 60 minutes to update a report you have just generated. You will see that the "refresh" button will appear once this time has passed. I can not generate a report from my website! There are two reasons why sometimes we can not generate a website review. First, check if your server is down by accessing your website and refreshing your browser screen (Control + F5). If so, check that it doesn't happen several times a day. If you see that your server is down frequently, we recommend you try a quality hosting provider. We work with DigitalOcean and we are very happy. Second, it is possible that your site has character encoding problems. Check using this free validation service if everything is OK. If there are no problems, get in touch with us and we will solve it as soon as possible. We launched MetricSpot recently and we are undergoing tests regularly (Beta Version). We are working on improving our website every day and it is possible that at some point you an error may appear. If so, please send us a message indicating the error code and copying the error message that appears. We promise to fix it ASAP! What uses can be given to the reports? Follow the guidelines to improve and optimize your website in order to increase your sales. Compare yourself with your competitors and learn from their best practices to improve your website. Keep track of the changes you're making in your website and measure their impact on traffic and conversion rates. Give your customers a free website review, or deliver a monthly report to monitor the evolution of your Marketing campaigns. Verify if the website Agency you want to hire is good by checking their Webs' scores. Set minimum quality standards for your website projects. You can search for website experts in our Qualified Professionals list. You can also verify the quality of their services by checking the scores of their websites.